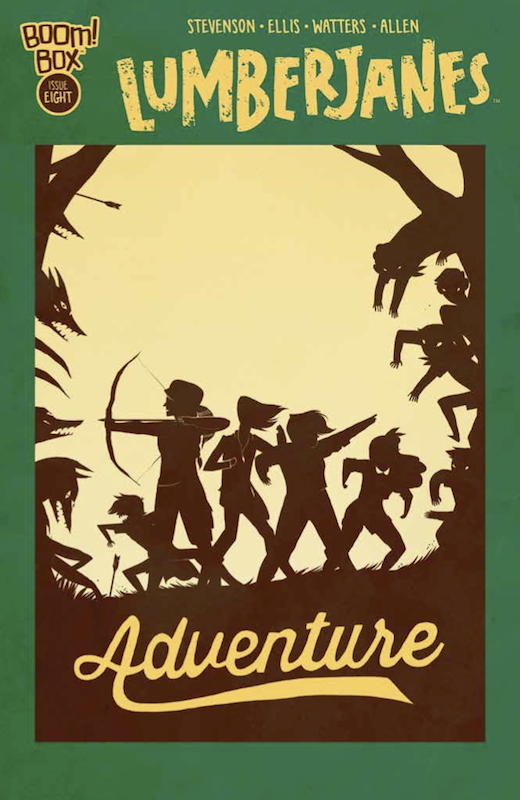 The first storyline (the series will continue past this) of Lumberjanes, written by Noelle Stevenson and Grace Ellis and illustrated by Brooke Allen, concludes with the gal-pal campers saving the world from a remarkably authentic adolescent Artemis. She’s selfish and distractible and manipulated and focused only on getting the better of her brother. Unfortunately, her self-centeredness has resulted in grim consequences for one of the scouts, but the power of friendship will win through once again, as it has since issue #1. The diversely inspired, thick-line art style of the book is really growing on me. It feels handmade and enthusiastic and inspiring and energetic and well-meaning, much like the characters. I wouldn’t have expected blending camp tales with remade mythology to work so well, but it’s very much in keeping with today’s remix culture. Lumberjanes is to today what the Dark Knight Returns was to another generation — a book that’s bringing in a whole new audience, an outreach book to a group that can love comics, once comics exist for them. Then it was older readers, those looking for mature content; now, it’s young women interested in active adventures, not appearances. It’s great to see a group of female lead characters (still rare in comics). Being a gang, they’re allowed to have different personalities and interests, instead of just being The Girl.